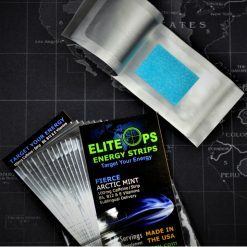 Elite Ops Energy Strips are an innovative alternative to coffee, energy drinks, and other energy products that deliver on the promise of convenience, portability and effectiveness. 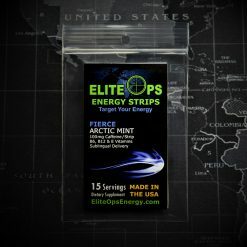 Elite Ops Energy Strips dissolve on your tongue and deliver a 100/mg dose of caffeine, along with vitamins B6, B12 & E. Elite Ops Energy Strips give you energy for hours without any crash. 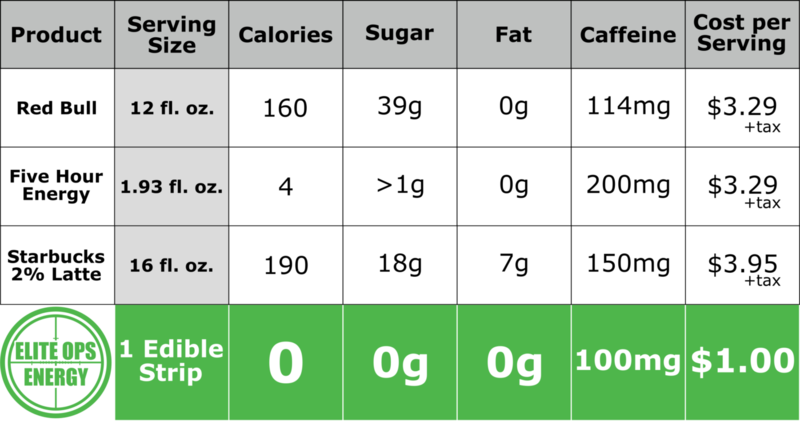 Elite Ops Energy Strips are sugar-free, fat-free, gluten-free and have zero calories. Unlike all other energy drinks (or shots), with Elite Ops Energy Strips there is no liquid consumption. (No liquid in = no liquid out.) The active ingredients are absorbed when the strip dissolves on your tongue, bypassing your digestive tract.